Kent Pigeon Control install bird netting, spikes for pest pigeons. We highly recommend a site visit which will enable us to determine the best pigeon control solution for your premises. A number of factors will need to be considered such as the size of the area to be protected and whether what we do effects members of the public or staff. Additionally the pigeon control deterrents we install should not be to the detriment of the building we are looking to protect from pest pigeons. There are times though where necessity must take place but we always strive to fit bird control deterrents that are unobtrusive and fit with the aesthetics of the building and also comply with health and safety requirements. Probably one of the most common bird prevention and deterrents we install to properties in Kent. Bird spikes are totally harmless and discreet. Available in both UPVC Plastic and stainless steel. 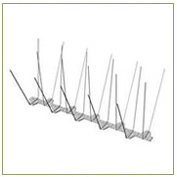 Can be fitted to roof edges, signage, ledges, window sills and gutters. Can also work in conjunction with other pigeon deterrents. Another popular pigeon deterrent. Available in a range of colours including transparent. 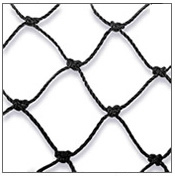 Pigeon netting can be installed over large areas and is one of our most robust products. We can also fit zips where access is required to areas of the building. Long lasting, fire retardant and rot proof. Avishock as you might imagine from the name, is an electrical bird deterrent system that works by sending a harmless low voltage pulse through a network of tracks which are placed where birds are landing. Avishock will not harm pigeons but simply change their habits and deter them from roosting/landing on your property. Ideal for buildings where discretion is required. A maintenance program is required after installation to ensure best performance. Yes the pigeons will think the building is on fire! It does not kill or trap birds, but immediately changes their behaviour so that they fly away. Birds will completely desert a habitat they have been using even for years! Designed to last for approximately 2 years and in all weather conditions including snow! 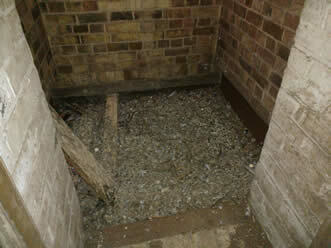 Pigeon guano can cause extensive damage to building structures and brings about health and safety concerns. 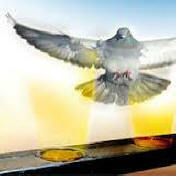 We provide a complete waste and cleaning service prior to fitting any pigeon control measures. Pigeon problems? We've got it covered!